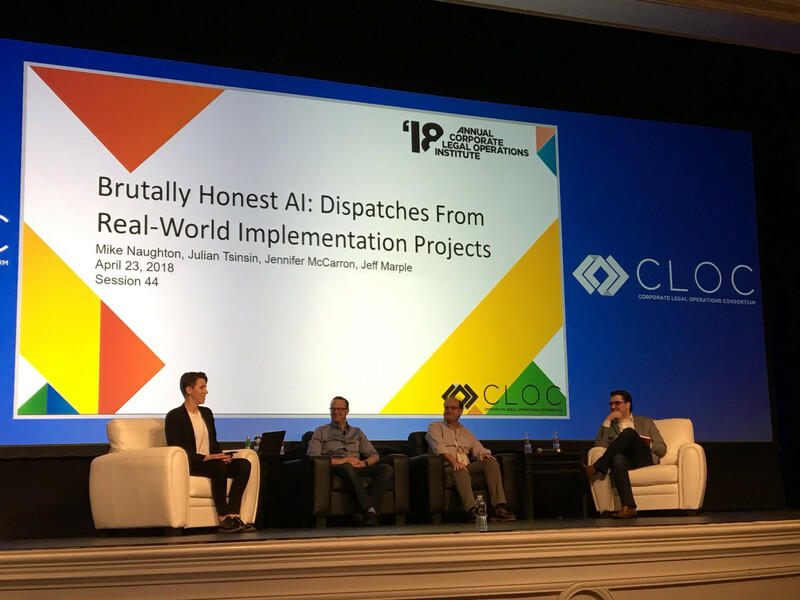 Last week at the Corporate Legal Operations Consortium (CLOC) meeting in Las Vegas, our own Daniel Martin Katz spoke on a panel discussing the widening scope of AI, machine learning, and contract analytics in the law. Filling in last-minute for Google’s Julian Tsisin, Katz joined Mike Naughton of Cisco and Jeff Marple of Liberty Mutual in a conversation moderated by Jennifer McCarron of Spotify. “Brutally Honest AI: Dispatches from Real-World Implementation Projects” was a hands-on discussion of the cutting-edge of AI. As its name suggests, the participants in the panel are each heavily involved in the AI space, with Dan bringing his legal expertise – and his experience in applied AI and machine learning right here at LexPredict – to the conversation. During the conversation, Dan and Mike Naughton of Cisco discussed the contract analytics project being jointly undertaken by Cisco, LexPredict, and Elevate Services. It’s an exciting time for us, and we are pleased to be working with Elevate services and Cisco, leveraging our open source software tool, ContraxSuite. LexPredict and Elevate are combining their resources to produce powerful new tools and methods for optimizing the usefulness of a company’s data. The two companies have worked in tandem with Cisco and achieved impressive initial results for its global operations. The 2018 CLOC Institute in Las Vegas provided a great opportunity to spread the word about contract analytics and how machine learning has successfully transitioned from the realm of theory into real-world business use.